The Horizon 2020 EnzOx2 project is a Research & Innovation Action co-funded by the Bio-based Industries Joint Undertaking. It has the aim of developing new bio-chemical technologies based on oxydative enzymes to obtain bio-based products. The overall objective of the EnzOx2 project is to develop new bio-chemical technologies based on the use of oxidative enzymes, largely unexplored at the industrial level, to provide innovative solutions in the production of some added value compounds from biomass components. In particular, EnzOx2 plans to develop the enzymatic conversion of bio-based 5-hydroxymethylfurfural (HMF) into diformylfuran, a platform chemical, and 2,5-furandicarboxylic acid (FDCA), a plastic building-block to be used in substitution of terephthalic acid. On the other hand, highly selective hydroxylation of plant lipids (such as fatty acids, terpenes and steroids) will be optimized for cost-effective production of flavour and fragrance (F&F) ingredients, active pharmaceutical ingredients (APIs) and others. 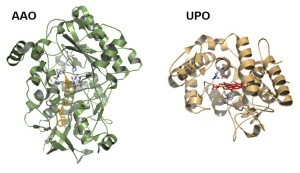 The potential of oxidative enzymes in such biotransformations has been shown by some of the EnzOx2 partners in previous projects, including several oxidation and oxyfunctionalization reactions catalyzed by different types of fungal oxidoreductases, such as oxidases and peroxygenases. 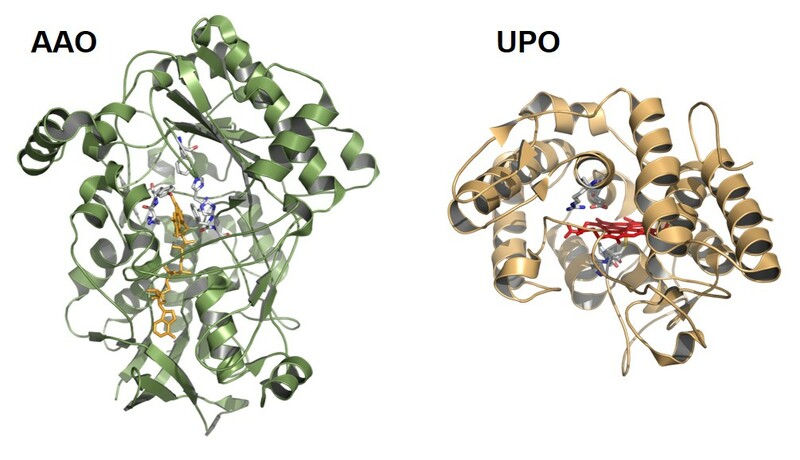 The recently discovered unspecific peroxygenases (UPO) secreted by fungi are able to selectively transfer one oxygen atom from peroxide to a variety of substrates (oxyfunctionalization) with high efficiency, with the additional advantage of being stable and self-sufficient, in contrast to other known monooxygenases. On the other hand, microbial oxidases not only constitute the source of hydrogen peroxide for peroxygenases, but they also catalyze interesting reactions using molecular oxygen as the ultimate oxidizer, including the oxidation of primary alcohols to the corresponding aldehydes. To attain the project objectives, the EnzOx2 partners are taking advantage from the largely unexploited diversity of oxidoreductases in fungi from special habitats, and sequenced fungal genomes, to obtain new enzymes of interest. Moreover, the catalytic performance, selectivity and/or stability of the best candidates are being adapted, when needed, to the required reaction conditions using different protein engineering tools. Although the selection of new enzymes was largely based on activity detection in fungal cultures, and sequences available in databases and already sequenced genomes, two new genomes representing groups of fungi scarcely investigated for enzymes of interest were sequenced by partner TUDresden. Together with JenaBios, they screened cultures and genomes for new types of UPO, whose industrial applicability is also being improved by enzyme engineering methods carried out at CIB and ICP institutes. Oxidases were largely investigated in the project to catalyze reactions of interest or as a source of the hydrogen peroxide required by UPOs. Aryl-alcohol oxidase (AAO) was selected as a model for these enzymes, and its reaction mechanism with both reducing (benzylic alcohols) and oxidizing (molecular oxygen) substrates was in-depth investigated by CIB for its application as an enzymatic catalyst. These applications include new enzymatic technologies for both sugar and lipid derived building blocks and other added value compounds, as explained below. Concerning production of sugar (furfural) based building blocks, during these months the two-enzyme cascade for HMF conversion were converted into FDCA previously described by project partners, and TUDresden proposed a new cascade involving AAO, UPO and galactose oxidase from Novozymes, with additional properties of interest. 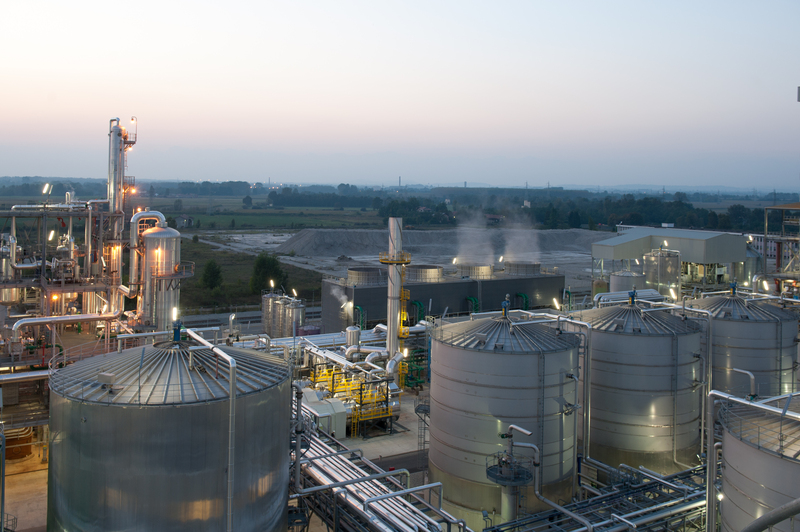 Since future large-scale production of FDCA-based bioplastics (by the joint venture of companies BASF and Avantium) will be most probably based on 5-methoxymethylfurfural (MMF), the former compound was also included in EnzOx2. A self-sustained enzymatic cascade for FDCA production from MMF was developed and patented by CIB, where the action of UPO is fuelled by hydrogen peroxide provided by both AAO and an additional oxidase acting on the methanol released from the demethoxylation of MMF by UPO. During the second part of the project, the most promising enzymatic transformations will be selected and several concepts such as substrate loading, co-factor addition, biocatalyst stability and downstream processing, among others, will be optimized by partner TUDelft in collaboration with the industrial partners and AIMPLAS. Finally, preparatory work for LCA analyses of the enzymatic processes, compared with chemical processes for the production of the same or similar compounds, has been initiated by USC to prepare the final evaluation of their technical, economic and environmental feasibility. The impact of the above enzymatic transformations is related to: i) the use of environmentally-friendly enzymatic technologies in the manufacture of bio-based bulk chemicals such as plastic building blocks; and ii) the selectivity of UPOs catalyzing specific oxygenation reactions of pharmaceuticals, and other speciality chemicals, that are difficult or very costly to be obtained using chemical methods. EnzOx2 is a three-year Research & Innovation Action funded with 3 M€ by the Bio-based Industries Joint Undertaking (www.bbi-europe.eu), a partnership between the EU (under Horizon 2020) and the Bio-based Industries Consortium (https://biconsortium.eu). The project brings together three highly-specialized SMEs in the areas of fungal enzymes (JenaBios, Germany), HMF production (AVA Biochem, Switzerland) and chiral chemicals and APIs (Chiracon, Germany); two world-leading companies in the sectors of industrial enzymes (Novozymes, Denmark) and F&F ingredients (Firmenich, Switzerland); one technological centre dedicated to the plastics sector (AIMPLAS, Spain); and six research/academic partners with high expertise in oxidoreductase structure-function and engineering (CIB-CSIC and ICP-CSIC, Spain), their application in different biotransformations (TUDresden, Germany, and IRNAS-CSIC, Spain), the design and optimization of enzyme-based bioprocesses (TUDelft, The Netherlands), and biocatalyst immobilization (together with other partners) and LCA analysis (USC, Spain). The project is coordinated from CIB, a biology institute belonging to the Spanish Research Council (CSIC). This project has received funding from the Bio Based Industries Joint Undertaking (JU) under grant agreement No 720297. The JU receives support from the EU’s Horizon 2020 research and innovation programme and the Bio Based Industries Consortium. This article reflects only the EnzOx2 Consortium’s view and the JU is not responsible for any use that may be made of the information it contains. Text by Marta Pérez-Boada and Angel T. Martínez, Centro de Investigaciones Biológicas – CSIC -.